We still managed to visit a bunch of cities. Here are 11 Things To Do in SoCal. Palm Springs is a desert city that was hugely popular among movie stars in the 1930s. It’s known for its 130 hotels and resorts, golf clubs, over 100 restaurants and dining spots, and nearby casinos and outlet malls. The drive itself is very scenic already. Did you know? Greater Palm Springs’ annual Restaurant Week is happening this June 2 – 11, 2017. Participating restaurants offer special lunch and dinner menus at set prices ($15, $20 or $25 for Lunch and $29, $39 or $49 for Dinner). When we visited Palm Springs, we stayed at Omni Rancho Las Palmas Resort & Spa in Rancho Mirage. It’s such a great getaway, especially if you play golf. But even if you don’t, the resort has other amenities and the nature views are just amazing. Just near Palm Springs is Palm Desert which is home to about 30 golf courses. This is where advanced golfers want to be as lots of big golf tournaments are held here. But it’s not just about golf, nature is also abundant here, and so is food. Classic Club Golf has a known restaurant, Bellatrix Restaurant. 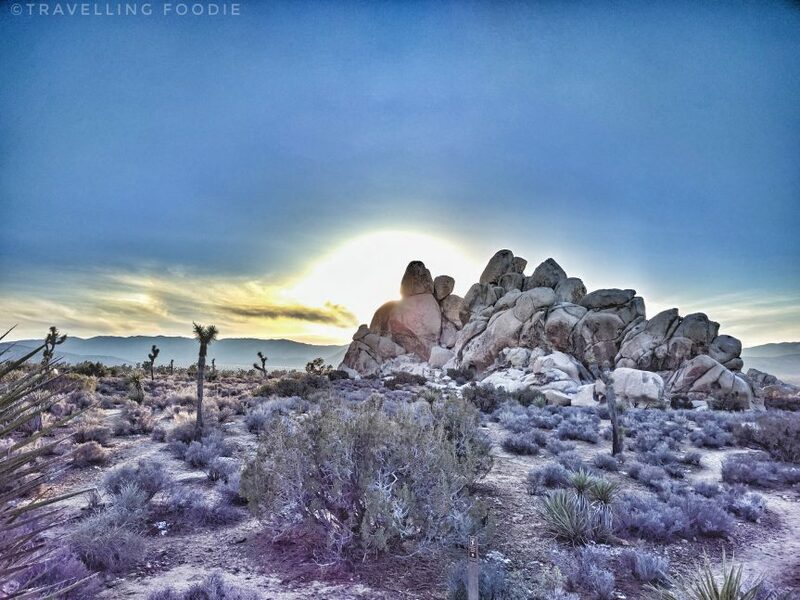 Joshua Tree National Park, as the name implies, is well known for its abundance of twisted, bristled Joshua trees. It’s also characterized by ruggest rock formations and stark desert landscapes. Travelling Foodie Tip: Don’t go here during Christmas day. We thought it would be empty since people would be staying at home, but instead it was packed with huge line-up of cars at the entrance. Despite being in California plenty of times, this was actually my first time doing the Warner Bros. Studio Tour Hollywood. It’s actually very fun especially if you love their TV Shows. Read about my experience of the tour here. You can’t go to California without visiting one of their beaches. What’s special about this beach is there’s a pier with a fisherman’s wharf, a row of seafood shops and restaurants offering fresh catch seafood. There’s also lots of water activities here because of the marina: harbor cruises, seasonal whale watching, kayaks, pedal boats and sail boats. I did had my first sail boat ride here. Manhattan Beach is quite a popular beach particularly because of The Strand, a section of Manhattan Beach where you’ll find some of the most expensive houses in the United States. It’s nice to stroll along The Strand to admire the beautiful million dollar homes. Lots of people love to surf here too, even during New Year when we went. Did you know? Majority of Manhattan Beach’s land was exposed sand dunes once. Now, they are buried underneath buildings and streets. Hermosa Beach is the neighbor of Manhattan Beach. When Hermosa Beach ends on the North, The Strand and Manhattan Beach begins. We actually walked from Hermosa Beach to Manhattan Beach then back. It’s such a great exercise while admiring the scenic views and the beach houses. Hermosa Beach features an amazing nightlife, which doesn’t necessarily start at night, with its Pier Plaza hosting various bars and restaurants. L.A. Live is the entertainment complex right at Downtown Los Angeles. With 5,600,000 square feet, L.A. Live features bars, concert theatres, restaurants, movie theatres and more, including the Microsoft Theater (which used to be Nokia Theater), Grammy Museum, ESPN Zone and the Microsoft Square. During Christmas, the Microsoft Square is transformed into a Christmas haven with a skating rink in the middle, a big Christmas tree, lots of lights and Christmas decorations. Adjacent to L.A. Live is the Staples Center, a multi-purpose sports arena for various sports and concerts. Watching the Lakers v.s. Jazz game on December 27, 2016 was my first time watching a live basketball game. Isn’t this the best way to have my first live game? Posted on April 19, 2017 by Travelling FoodiePosted in Burbank, California, Glendale, Hermosa Beach, Los Angeles, Manhattan Beach, Palm Desert, Palm Springs, Rancho Mirage, Redondo Beach, Travel, USATagged accommodations, activities, entertainment, guides, nature, sights and landmarks.